Cooking for those you love is always rewarding, and February is all about the heart. These recipes prove you can catch your omega-3s and a romantic, healthy meal at the same time. 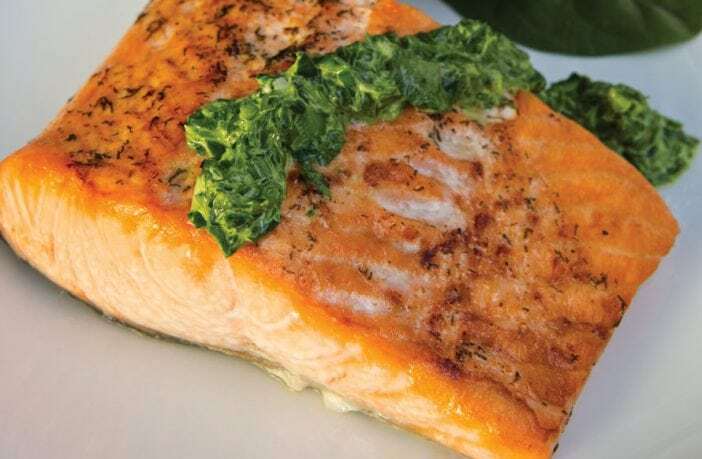 Whether you start with fresh fish or frozen fillets, these mouthwatering recipes will make your meal the catch of the day. Don’t forget to be a little fresh by taking advantage of winter greens, still available through Community Supported Agriculture programs and farmers markets. Preheat the oven to 450 degrees. Grease a baking sheet, add the fish fillets and set aside. In a small bowl, beat the egg with the water. Brush the fillets with half of the egg mixture. In a separate bowl, combine the panko, salt, cayenne, black pepper and paprika. Add butter, and mix with your hands until the panko is well coated. Brush the fillets with the remaining egg mixture. Evenly divide the panko coating on top of the fillets, pressing lightly onto the fish. Bake 9-10 minutes or until golden brown and the fish flakes easily with a fork. Serve immediately. Preheat the oven to 350 degrees. Grease a rimmed baking sheet, and add the fillets. Sprinkle with half the salt and pepper. Melt 1 tablespoon of the butter in the microwave on low power for 20 seconds, and brush the tops of each fillet. Place a tablespoon of the ground pecans on each fillet, pressing slightly into the fish. Drizzle with half the lemon juice and half the zest. Bake 15 minutes or until the fish flakes easily with a fork. Meanwhile, place the remaining butter in a small saucepan over medium heat. When the butter has melted, add the flour, and cook for 1 minute. Add the clam juice, and stir constantly until the sauce thickens. Add the remaining salt, pepper, lemon juice, zest and wine. Serve with the warm fillets. Place the spinach, bell peppers, parsley, onions and 1 tablespoon of the lemon juice in a food processor. Chop, but do not grind to a puree. Transfer to a serving bowl, and stir in the mayonnaise and green onions. Cover and refrigerate at least 2 hours. Preheat the broiler to high, and remove the sauce from the refrigerator. In a mixing bowl, whisk together the olive oil, dill, salt, pepper and the remaining lemon juice. 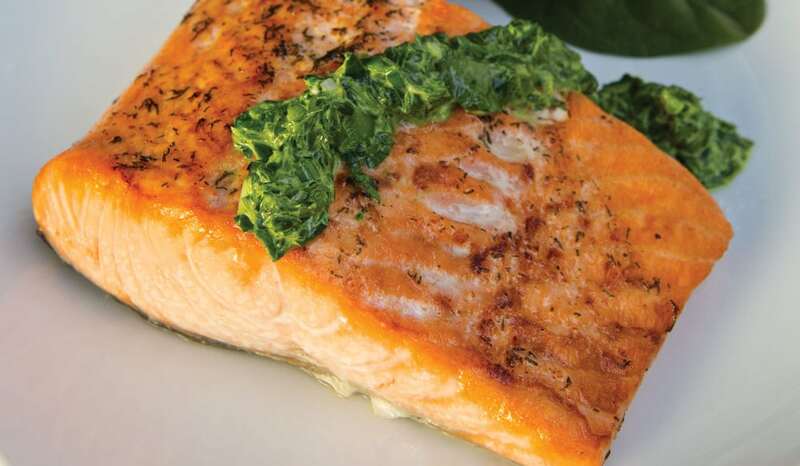 Brush on both sides of the salmon, and place on a broiler rack. Broil 3 minutes and turn. Broil an additional 2-3 minutes or until the salmon is done but not dry. 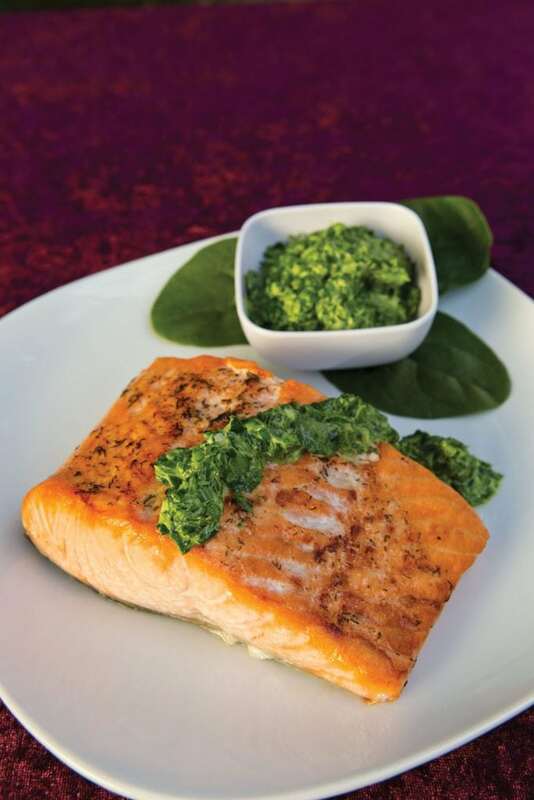 Serve immediately with the Spinach Sauce. Preheat the oven to 400 degrees. Lightly grease a broiler pan and set aside. Brush both sides of each fillet with the lemon juice, and sprinkle evenly with the salt and pepper. Place the egg white and milk in a shallow dish, and whisk to blend. Place the breadcrumbs and almonds in a separate shallow dish. Dip one side of the fillets in the egg mixture, then in the breadcrumb mixture, pressing to evenly coat. Place with the coated side up on the prepared pan. Bake 10-12 minutes or until the fish is opaque and flakes easily with a fork. Serve warm. Place the oil in a Dutch oven over medium-high heat. When hot, add the onions, celery and salt. Stir, cover and immediately reduce the heat to low. Cook 15 minutes without stirring. Remove the lid, and increase the heat to medium. Add the wine or chicken stock, and simmer for 5 minutes to reduce slightly. Stir in the seafood stock, potatoes and 3 cups of water. Increase the heat to medium-high, and bring to a boil. Reduce the heat to low, and simmer 20 minutes. Add the fish, shrimp, cream, dill and pepper. Bring to a simmer, and cook just long enough to cook the seafood, about 4 minutes. Serve warm. Preheat the broiler to high. Place 1 tablespoon of the oil in a 9-inch ovenproof skillet. Top with the fillets (if there is a skin, place the skin side down). Sprinkle evenly with the salt and pepper. In a small bowl, whisk together the mayonnaise, 1 teaspoon of the mustard and the capers. In a separate bowl, combine the breadcrumbs with the remaining oil and mustard. Make sure the breadcrumbs are evenly coated by using your fingers. Spread the mayonnaise mixture evenly over the tops of the fillets. Top with the breadcrumb mixture, pressing to make sure it adheres. Broil about 5 minutes or until the breadcrumbs are golden brown and the fish is done. Let rest for 5 minutes before serving warm with the lemon wedges. Place the cornmeal in a shallow pan and the eggs in a separate shallow pan. Place the taco seasoning in a large zip-top bag. Add the fillets one at a time to the bag, and shake to evenly coat. Dip in the eggs, then the cornmeal. Place on a baking sheet lined with waxed paper, and repeat with the remaining fillets. Add the oil to a large skillet over medium-high heat. When hot, add the fillets (cook in batches if necessary), and cook 3-4 minutes on each side. Serve warm. Place the peppercorns, allspice and cloves in a medium saucepan over medium-high heat. Heat just until the spices start to pop. Transfer to a mortar and pestle and crush. Reduce the heat to medium, and return the spices to the saucepan. Add the rum, soy sauce and sugar, and simmer until the mixture is reduced by half. Strain the mixture through a layer of cheesecloth, and allow to cool to room temperature. Discard the solids. Place the fish fillets in a 1½-quart baking dish, and pour the cooled liquid over the top. Marinate for 10 minutes, turning halfway through. Meanwhile, preheat the oven to 425 degrees. Bake for 7 minutes or until the fish is cooked through. Serve warm with a topping of salsa.